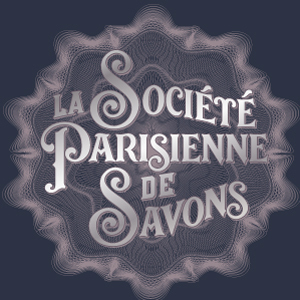 I've had the privilege of designing a great line of products for La Société Parisienne de Savons. There are 20 different fragrances, each with a unique design motif including soaps, creams, powders, candles, fragrance diffusers, ceramic soap dishes and, a few more items I'm probably forgetting. 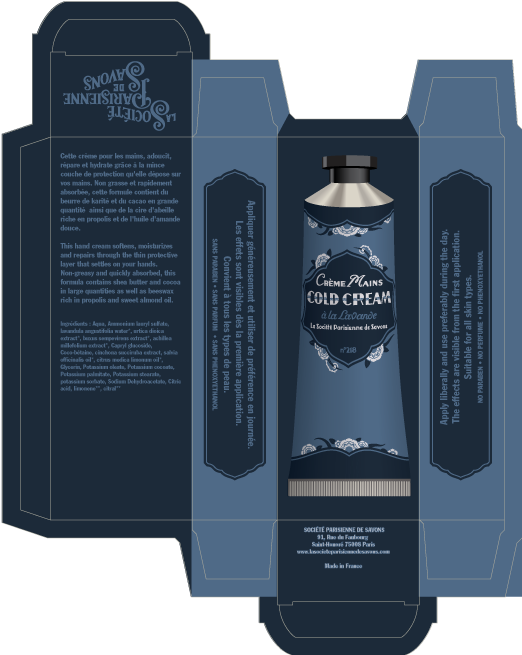 Here are the new hand creams. Shown are dies for the boxes which conveniently, also display the tubes themselves. 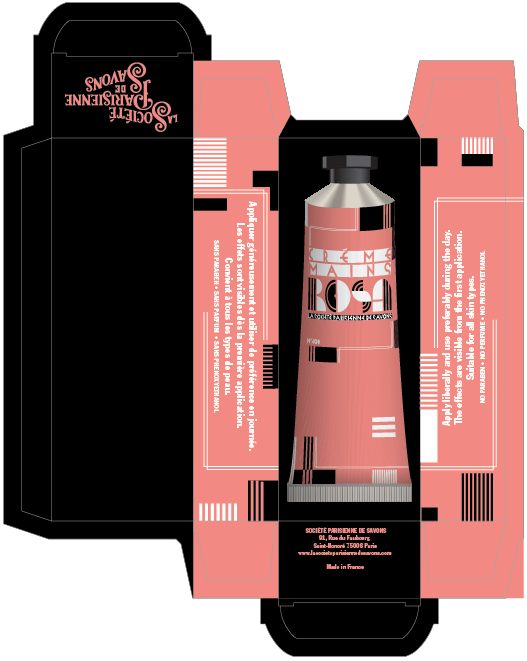 Above each image, you will find a description of the fragrance. The one for Eau de Cologne is quite poetic. Do you think the imagery fits the fragrances? Discover the excitement of a scent full of memories. 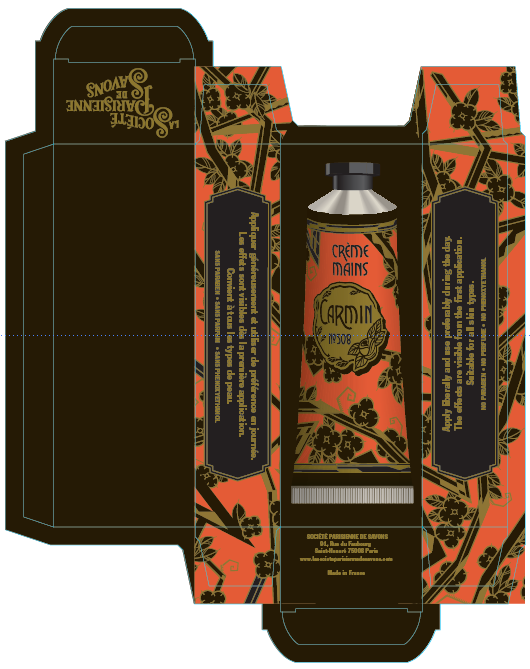 Carmin combines spicy and sweet fragrances of bitter cardamom and sandalwood. Enter the mysterious paths of an Indian garden, and enjoy a unique sensory experience. 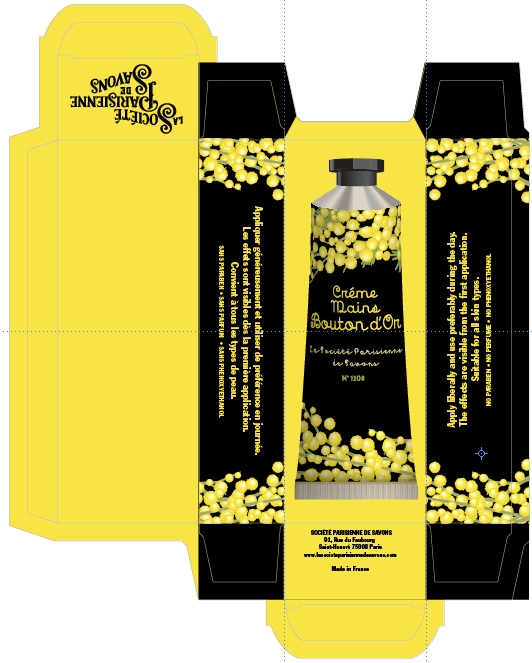 The master soapmakers of La Société Parisienne de Savons watch carefully to provide you with the highest quality, offering an experience of well-being ever renewed. “Women are born rival each other.” But who has not wanted to be without equal? Unique, unrivaled... Sans-Rival goes beyond the ordinary, taking you to unexplored landscapes of unique oriental scents. The aromatic subtlety of tonka bean affirmed by the crispness of fig wood escapes from the melancholy heart of jasmine and sandalwood, to an earthy depth of sunny brown cedar and musk. Behind each flower and its promise of a unique fragrance lies an emotionally charged affirmation . Their mere presence in the air is enough to complete perfect romantic scrolls. French poetry of flowers engages you in a soaring flight of feathery petals. 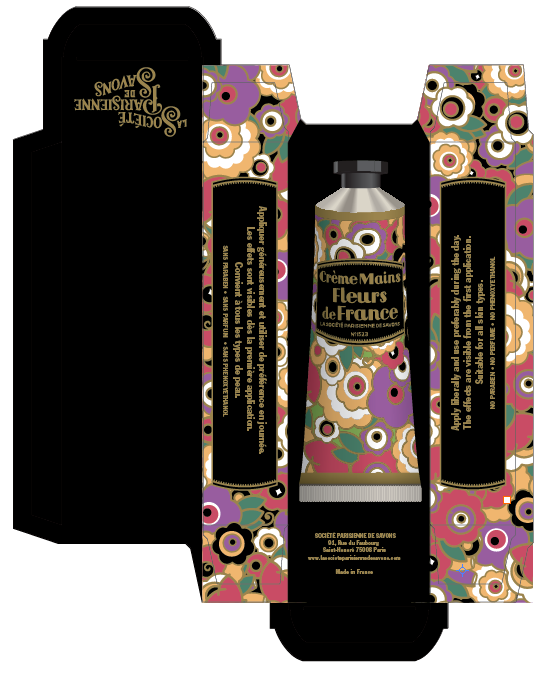 Fleurs de France illuminates the powdery delicacy of violet and jasmine, revealing a spicy heart, luminous combination of clove and heliotrope warmed by the sweet sensuality of white musk and vanilla . A source of most fabulous myths, Cadolia transports you to the shores of Sicily, Land of Beauty. With its cocktail of citrus with soft Mediterranean features, this fragrance is an invitation to travel. Green top notes exalt crystal freshness of orange and grapefruit. 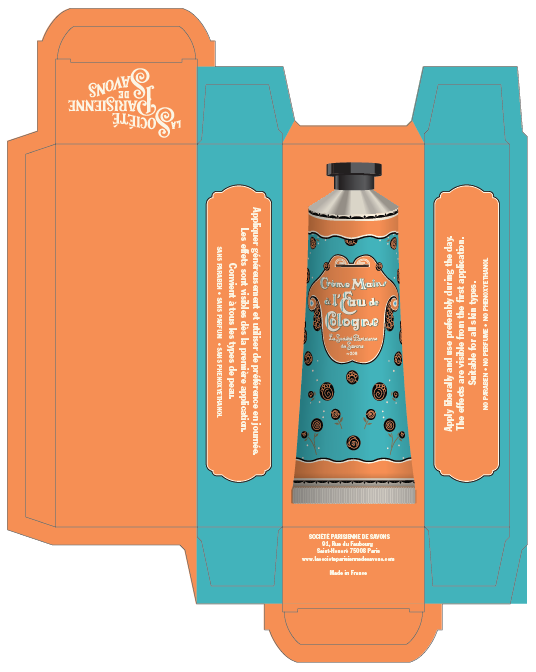 Under this cloud of citrus, fruity and delicious subtle orange blossom combines with the radiant delicacy of jasmine, revealed by the playfulness of tangerine. 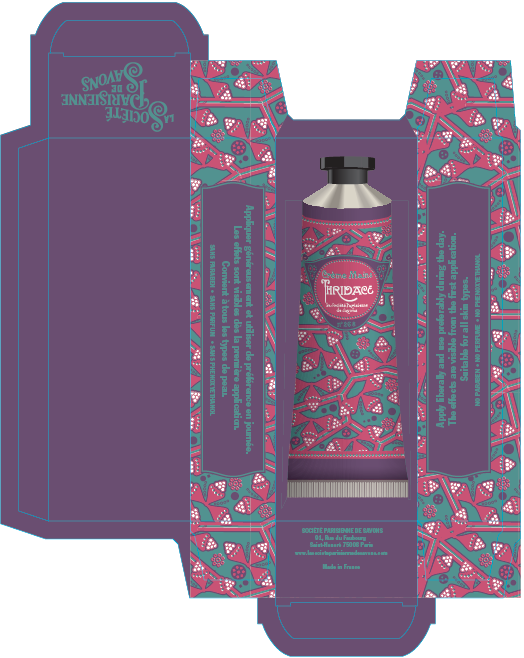 This fruity floral bouquet rests on a shimmering harmony of musk and sandalwood. Originating in Cologne, Germany in 1709, the fragrance which reminded its creator of “an Italian spring morning, of mountain daffodils and orange blossoms after the rain” soon became the preferred scent of nearly all the royal houses of Europe. This is the origin of the frangrance that "set the bar" for all that followed. 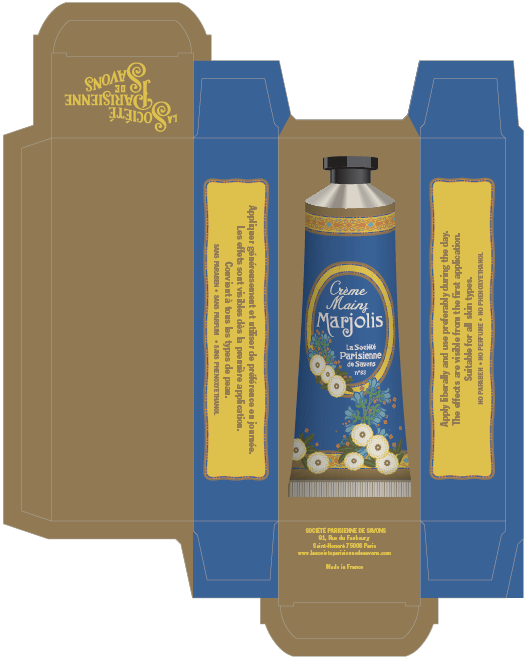 The delicate, aromatic scents of Cold Cream will transport you to the fields of the Mediterranean coast. 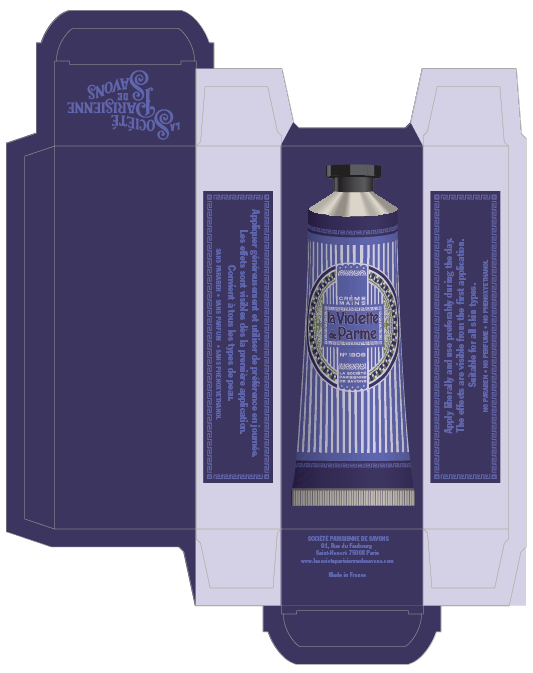 Subtle notes of lavender enhanced with patchouli and rosemary will revitalize your senses. The island of Cyprus is associated in Greek mythology with the cult of Aphrodite. Its waves conquered the legendary goddess who would never leave. Bask in its soft woodsy and fruity notes and imagine the rising sun revealing the generous curves of the Island of Love. In it’s heart, discover a crystal cloud of bergamot combined with tangerine, revealing also the fragrance of rose warmed by vanilla, its shimmering summer notes seduced by the sensuality of musk and benzoin. 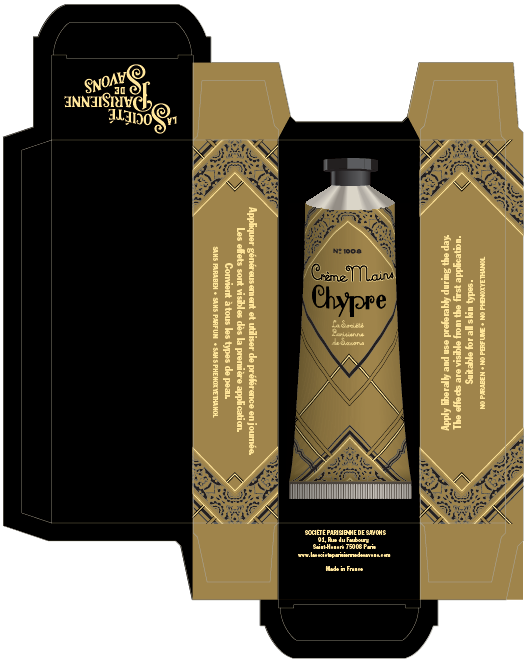 A royal and flamboyant fragrance, offering your an enigmatic and assertive sensuality. Enhanced by a intoxicating bouquet, let yourself be immersed in its regal elegance. Feel the emotion of a floral scent rich in memories, offering you softness and elegance through a subtle blend of violet, rose and jasmine. Enhanced by its powdered effect, let yourself be captivated by its character and refinement. 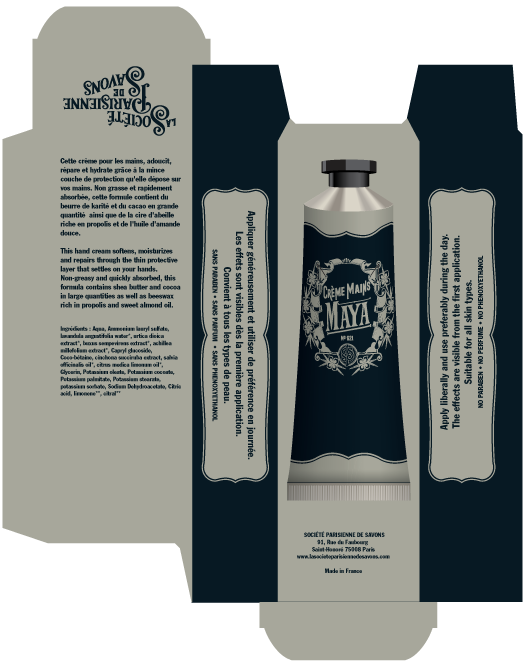 Maya captures the mysteries of the Far East and takes us on a journey to lands of wonderful and precious essences. A fresh woody fragrance blending intrigue and timeless desire..
Be transported by the exquisite wedding of the deliciously fruity and gourmet floral and fresh notes of Savonia. It’s the audacity of a whirlwind with surprising freshness and a refined sensuality. 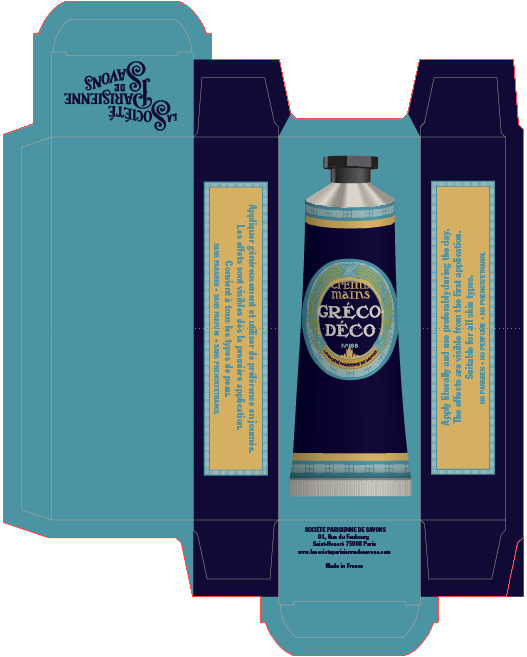 Greco Deco offers an idyllic trip along the shores of the Peloponnese with its fresh and woodsy scents. 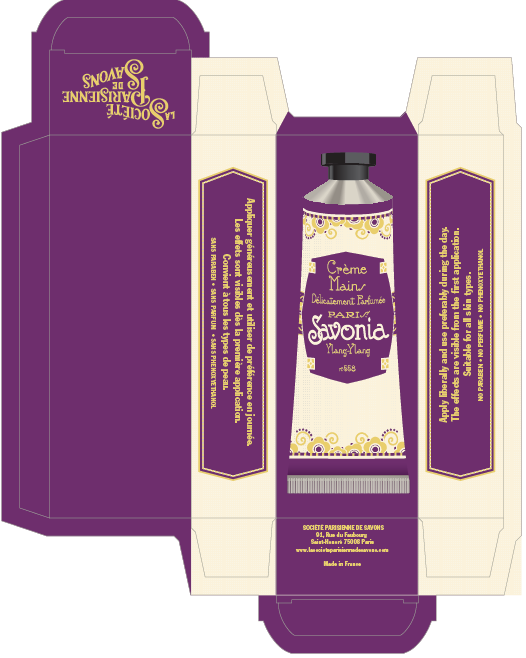 The ingenious marriage of iris and patchouli invites you on an unpredicatble and sensual journey. Oregano known for its magical aura as both a love potion and protection from evil, derives its reputation from its supposed creation by Aphrodite, goddess of love. A few leaves in the meal of the chosen and his heart would be yours forever. Be transported to the sunny fields of Provence where the delicate fragrances will immerse you in a dream of fulfillment. A gourmet composition that arouses your senses, awakening the sweet distant memories of childhood. Its enchanting fragrance will take you on an extraordinary aromatic journey. 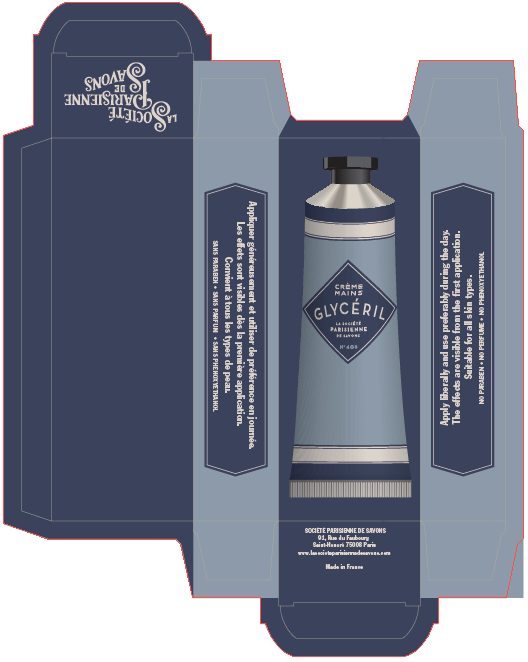 Let yourself be carried away by the warm and reassuring opulence of Glycéril. 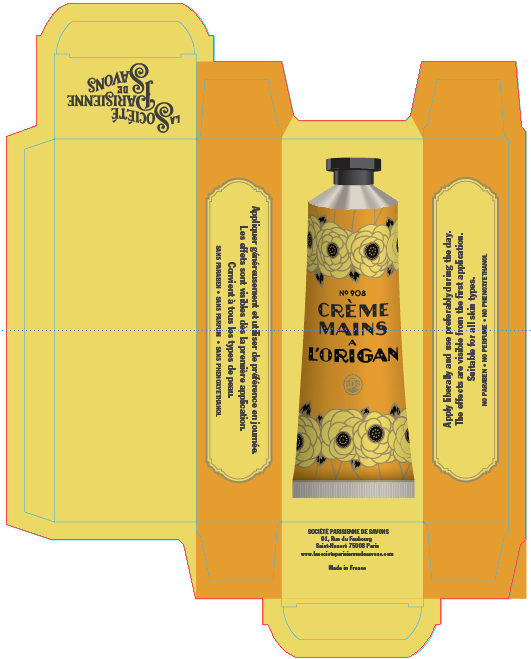 Enriched with moisturizing cream, it will give you a sensation of incomparable sweetness. “The bouquets of summer or fall rarely shine with the newness of spring flowers, but the memory of a beautiful bouquet stays forever.” Experience of the complex facets of Bouquet Velours, and make this moment unforgettable. Feel the exotic delicacy of passion fruit enlivened by a harmony of green leaves. Be moved by the romantic heart of rose and lily of the valley, quickly overtaken by the pleasure of vanilla and musk. 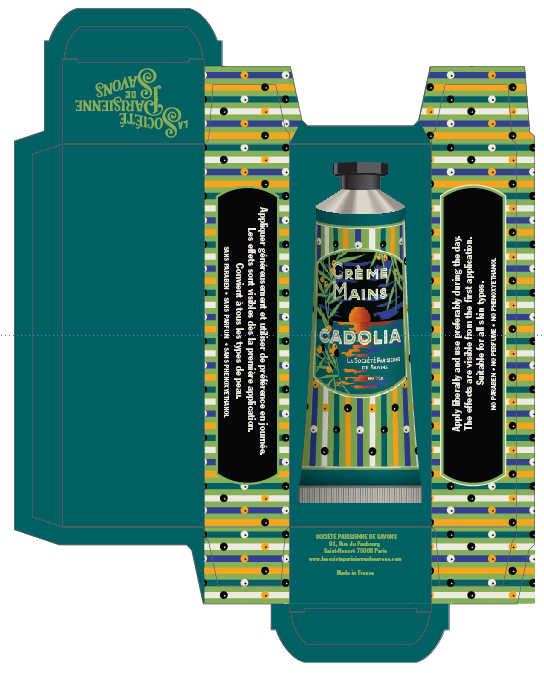 The combination of sensual jasmine and ylang-ylang will take you back time to a moment in a lush tropical garden. 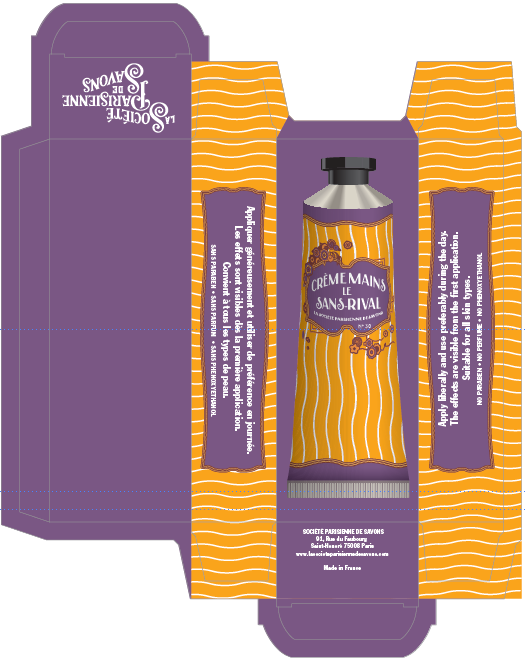 Its unique formulation will leave you with an unequaled feeling of softness. In mythological legend, Chloris, the goddess of Spring flowers transformed the body of a nymph into the first Rose. Aphrodite gave her beauty. Dionysus, the god of wine gave her, a sweet fragrance and the three Graces, charm, joy and radiance. Crowned queen of flowers by Apollo, she is now the jewel of every garden. Take a moment of tenderness beneath the caresses of Rosa’s downy petals and let yourself be intoxicated by the sensual scents of Rose, Iris adorned with the sensuality of White Musk. “O whiteness of all the whiteness, immaculate flower, resplendent love, reconciling me with beauty” In his Ode to Magnolia, Pablo Neruda, inspired by its delicacy and elegance, makes it a symbol of purity. It’s beautiful, ephemeral, comes in the season of love and does not see autumn. 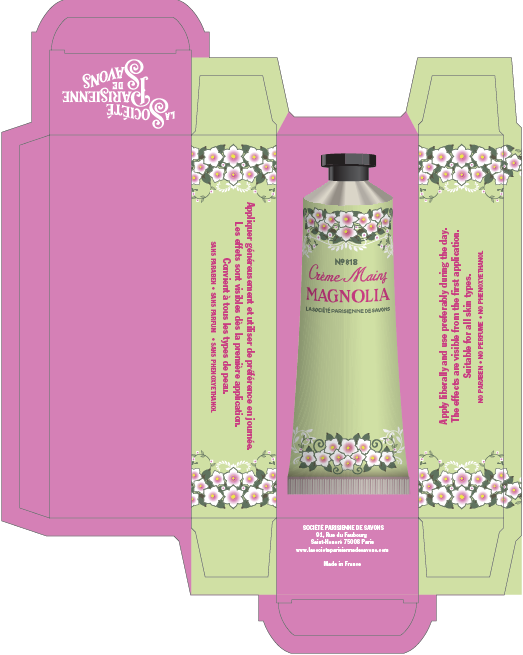 Let your senses be touched by the poetry of Magnolia. The soaring, sparkling cherry blossoms mixed with the power of cassis reveal the romantic heart of rose and jasmine with the shimmer of musk and orchid. “Grandmothers, are like the mimosa: it's soft and it's fresh, but fragile.” With this famous sentence, Marcel Pagnol revives tender childhood memories and feelings associated with the buds of this flower: sensitivity, secret love, and security. Its floral and orange scent awakens a fragrance of Mediterranean accent. The fresh and delicate perfume of the mimosa is enhanced by a sparkle of cyclamen. It is a light and intense fragrance of contrasts, a floral duo awakened by the subtle blend of violet and orange blossom and wrapped in warm swirls of vanilla and heliotrope.